Provided by Allen Browne. Created: March 2007. Last Updated: November 2008. 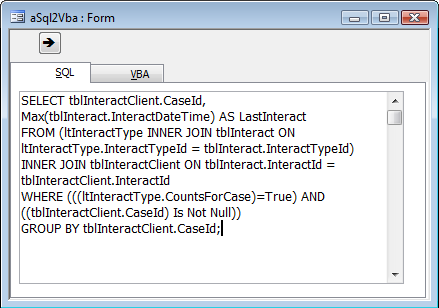 Rather than typing complex query statements into VBA code, developers often mock up a query graphically, switch it to SQL View, copy, and paste into VBA. If you've done it, you know how messy it is sorting out the quotes, and the line endings. Solution: create a form where you paste the SQL statement, and get Access to create the SQL string for you. The form just needs two text boxes, and a command button. SQL statements can be quite long, so you put the text boxes on different pages of a tab control. In the first page of the tab control, add a unbound text box. Set its Name property to txtSql. Increase its Height and Width so you can see many long lines at once. In the second page of the tab control, add another unbound text box. Name it txtVBA, and increase its height and width. Above the tab control, add a command button. Set its On Click property to [Event Procedure]. Click the Build button (...) beside this property. 'Purpose:   Convert a SQL statement into a string to paste into VBA code. strSql = Replace(strSql, """", """""")  'Double up any quotes. Hint: If you want extra line breaks in your VBA code, press Enter to create those line breaks in the SQL View of the query or in your form. These versions lacked the Replace() function. To use the code with those versions, copy the custom Replace() function from this utility. 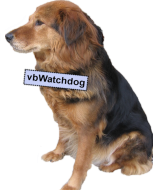 What did you think of 'Easily copy an SQL statement from a query to VBA'?